Omega Tool Corp., a major General Motors supplier, has created a video demonstrating the build process of the plastic body panels for the current generation Corvette C6. Or at least that’s what it was supposed to be. As it turns out, the video instead features the front bumper of what appears to be the next generation Corvette due out next year. Look at the photos and make the call. It’s not hard to see that the composite nose being built is not that of the C6, as the proportions are all off, and the C6 doesn’t have such a wide mouth. However, it appears to be a total match to the renderings of the Corvette C7 that came about at the end of last year. 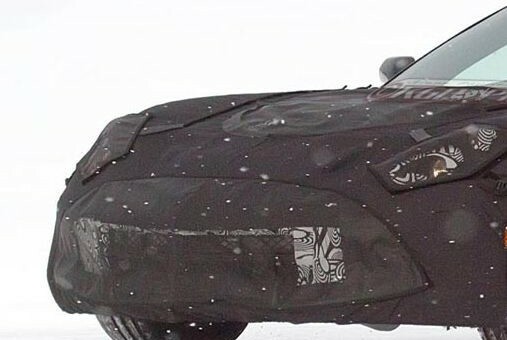 At the time of this write-up, the video has been taken down, but the fellows over at Corvette Online have managed to provide several screen shots of the alleged front fascia of the C7, which we have gone to provide as well. Update: The video is back, and as an extra, briefly shows the rear fascia of the C7 as well. Have a look! Update #2: Due to the threat of legal action, we’ve removed the photos and video. Ooops…LOL. But I really wonder if that was really a foul up or it was a carefully orchestrated plan to cause an interest ripple? If I was in charge of a car company I would have an entire department dedicated to “slipping” stuff through the cracks. LOL. True, while i think this might be real, if I was a major car company, I would definitely have a division that makes controlled leaks. That could be very profitable. Before the Viper was released, SRT had about a dozen or so posts on Facebook saying ‘If this post get’s 10K shares, we will leak another photo of the 2013 Viper. Although a few posts did not meet demands, they gained substantial popularity and anticipation for its release. Watch the Corvetteonline video in the above link. Get to the part where the computerized probe is moving around the stamping die. The probe is measuring the inside of the REAR fascia, not the FRONT one as seen in the CAD model. The rear looks similar to the Jalopnik C7 render a few months back. Thanks for the heads up, Graw. We’ll get the video up here as well. I definitely think this is real. Why would they get all the stuff set to make that specific front fender, just for a fake. And even though it looks like this will come true, I really hope that the Camaro-like lights don’t make it on the Corvette.